Accessible from various client and platform software, the 3-Axis Joystick USB Keyboard from Hikvision features joystick and keyboard modes for adjusting your surveillance system. 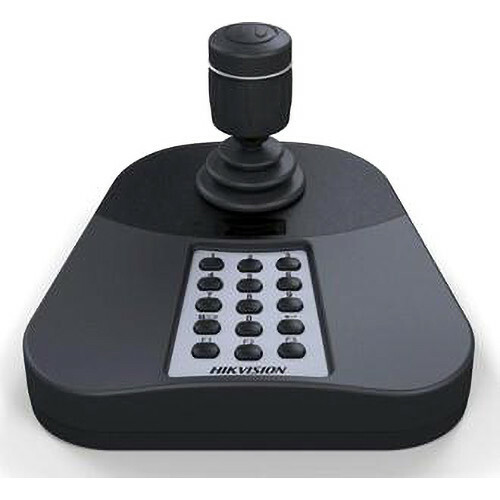 The 3-axis joystick can be used for panning, tilting, and zooming in on the desired area. The two control buttons located at the top of the stick allow for ergonomic one-handed operation. While in keyboard mode, the 15 programmable buttons can be used to make adjustments to the DVR settings, as well as window switching, channel switching, and on-demand picture capturing. On-keyboard indicators inform the user of which mode they're currently in, keyboard or joystick, and a digital tube displays the input number for convenient information. With compatibility and support for the USB HID protocol, the keyboard can be quickly installed to your DVR and PC. Box Dimensions (LxWxH) 9.9 x 8.6 x 7.5"
if this keyboard can work in any NVR? Asked by: Cesar III V.
You would need to confirm with the manufacturer of the NVR that it supports 3rd party USB controllers.